The flowers are about 3cm across and a well grown plant produces them in profusion. Well done for 600 days. I really enjoy reading about your beautiful orchids first thing every morning! On our trip to Burnham Nurseries we bought an orchid called Liparis Elliptical. My children wanted it because it looks like an “onion”. It isn’t on your website and there doesn’t appear to be much on the internet. Please could you tell me anything about the orchid. Thank you. That sounds great. 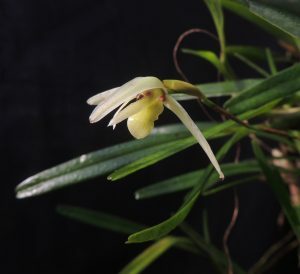 We have come across a number of Liparis species in Loas, Sikkim and Rwanda growing as either terrestrials or as epiphytes and as a rule the species with pseudobulbs and leathery leaves are epiphytes while the large soft leaved species are terrestrials. Thank you. This one has waxy leaves and two pseudo bulbs. A tree growing “ onion” sounds fun!